Yesterday was Melbourne Cup day. A benevolent and festive spirit subsumes Australians during this time — in the morning I was wished “Happy Cup Day” at least twice before 9am. And no, they were not referring to a day in celebration of menstrual cups as I considered for a brief moment (although that would be a great subversion — let’s look into this!). See, the Melbourne Cup, if you haven’t heard of it, is Australia’s most prestigious horse racing event and foremost cultural occasion. While the majority of Australians couldn’t care less about horse racing most of the time, a singular three-minute exception is made when it comes to The Cup. Until recently, the Melbourne Cup was even granted a national public holiday which, while it lasted, the Australian government described as the day that annually stops the nation; “Australia’s most famous Tuesday.” It has even been suggested that the level of devotion and national reverence that the Cup demands befits a religious festival. Still, even without a national holiday to commemorate it, the Melbourne Cup has been, and remains, a significant national event. A few of us even remember being thrown into a betting sweep in primary school as children. This is our thing in Australia: we have The Cup. 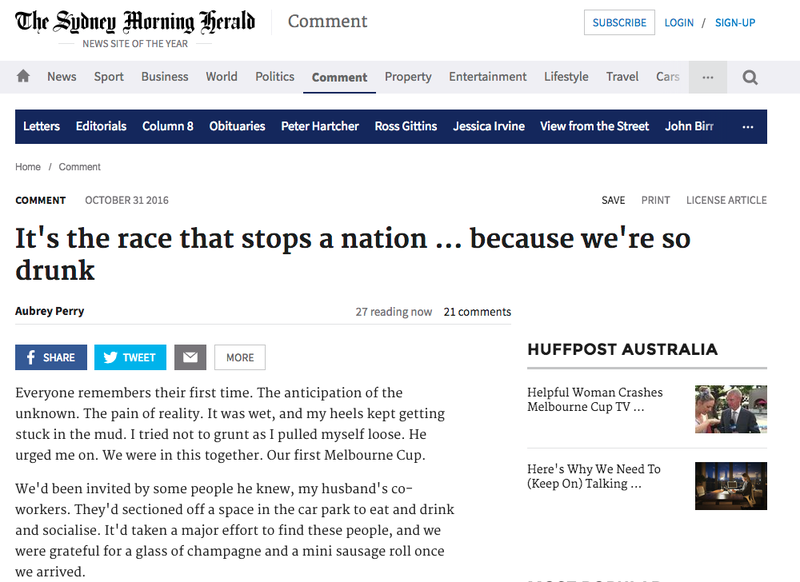 But the Melbourne Cup sits at the surface of a deep identity complex overhanging Australia as a nation. This year marks one and a half centuries since the beginning of The Cup’s tradition, as it lives on as a relic of our colonial past. Australia is holding onto this settlement memento, tightly. 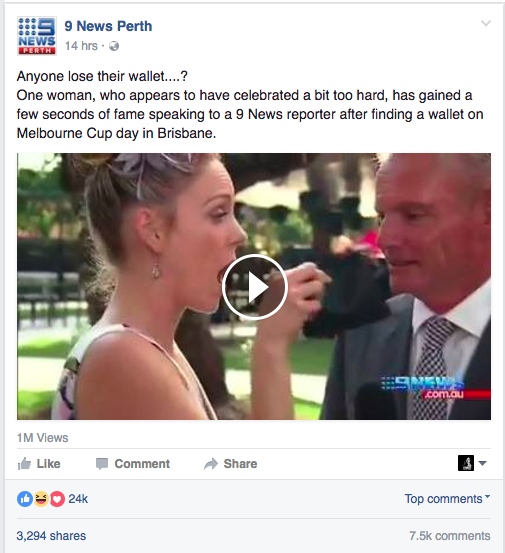 And, as the media consistently points out, the true star of the Melbourne Cup is: alcohol. All of this shouldn’t come as a surprise. Australia (or rather, white Australia) has a long history of booze worship, and the Melbourne Cup is the perfect time to attend a chapel service in alcohol’s name. First there was the colonial practice of using alcoholic spirits as currency, and the establishment of cultural drinking norms developed in the generations that followed. We need only look to our favourite national figures to observe the value of alcohol in our lives (see former Prime Minister Bob Hawke: world record-breaking beer sculler). Even today, the way Australians venerate alcohol has filtered down into our language; as comedian Neel Kolhatkar points out, we have an inexhaustible inventory of slang words to describe drinking. So for better or worse, alcohol is important to Australia as a country. Or at least, it seems to be a key part of how many people define themselves as Australians. Maybe this is because, well, for a country that has struggled (in its albeit short history) to identify a desirable and cohesive national narrative, the things that “make us Australian” are few and far between, and therefore, more valuable. And the Melbourne Cup? By virtue of placing booze on the winning platform, the event seems to be some sort of manifestation of the virtuous myth of alcohol as we are told of it collectively in Australia. 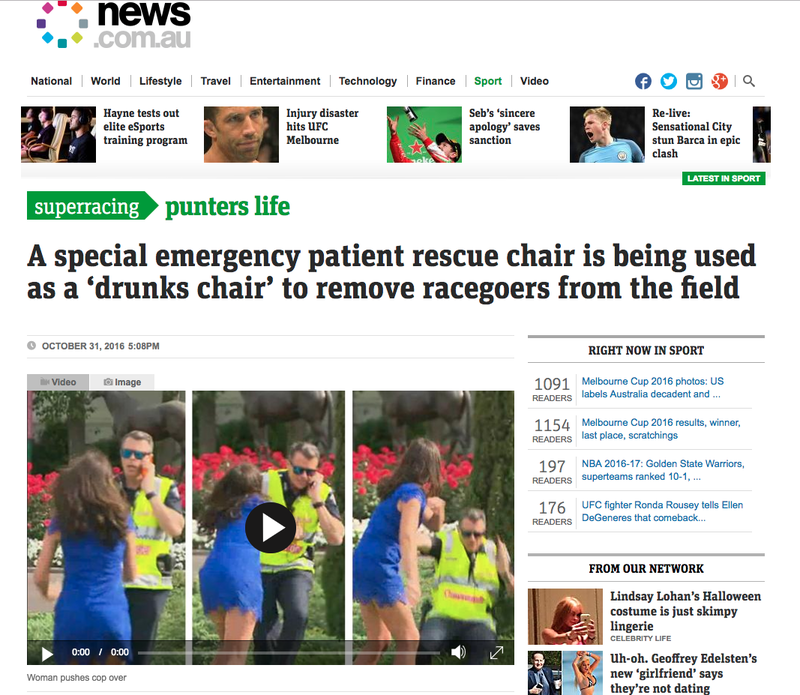 And honestly, considering the way the media has been depicting the event, particularly over the last few years, I think the Melbourne Cup and its associated boozing deserves a closer examination on our part. While on the surface it may seem good to talk about the rampant alcohol use at such events as The Cup, the problem is that: by vilifying “other” individuals, we undermine any possible positives to come from such a reflection, and even reinforce the collective drinking culture by presenting a straw-man argument of what “bad drinking” actually looks like. At an event that intoxicates an entire country, here we are pointing fingers at only a few unfortunate individuals (almost always women — more on that later), held up as examples of those “rare” cases who “can’t handle their booze,” and are, by implication, personally at fault. In doing so it short-circuits an opportunity to reflect on a culture that actively wants (and it almost wouldn’t be an exaggeration here to use the word “forces”) you to tread this fine-line of appropriate drunkenness, but Heaven help you if you misjudge it by a drink. Another of our concerns at Hello Sunday Morning, is the aforementioned gender-based judgement which appears to specifically vilify women drinking. 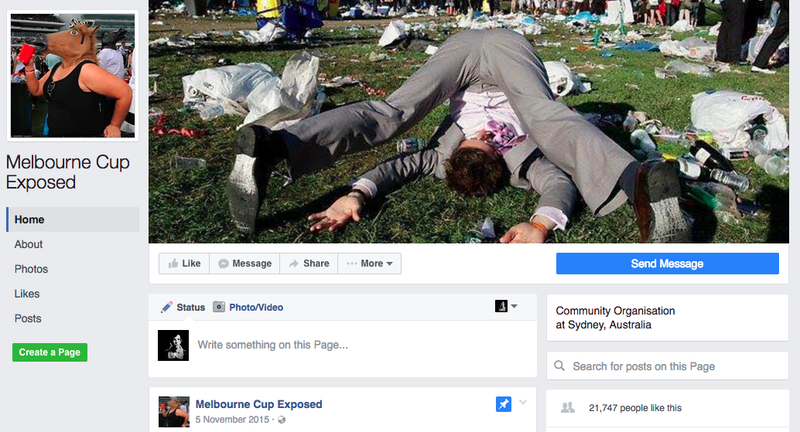 Consider the infamous Instagram account from a few years ago, Drunk girls of Melbourne Cup. Maybe it’s along the same lines of the conversation we began last week, when we noticed the way media have been framing discussions about women drinking. When a study was published reporting that women are drinking almost as much as men, a media storm erupted implying that these findings indicate a paradigm shift in the way we perceive alcohol use. But we think that perceiving alcohol use through a gendered lens is both reductionist and unhelpful. Rather than focusing on how a subset of the population drink, we need to think collectively about how we all drink. Again, this is a cultural issue. And the Melbourne Cup seems only to reiterate that. Similarly I have been contemplating the Melbourne Cup’s role in corporate culture. It’s easy to feel as though you’re missing out when even your workplace jumps into an office betting sweep. Almost the whole country checks out of work before the main race, all cheering with a champagne glass in hand. What about people who don’t drink? Those who don’t gamble? Thinking of this I suddenly begin to feel the pressure they may encounter on Cup Day. It feels like we’re told that celebrating this event is a salute to your identity as an Australian, to being a part of your workplace, to being a culturally engaged member of our society. But I don’t believe for a minute that we all agreed to this. But outside of these concerns and ruminations, what do we want to take away from this event? Rather than vilifying the behaviour of individuals, mightn’t it be better to take a minute to reflect on what all of this means? Maybe, The Cup can be a joyful celebration of the rich and plentiful life we have here in Australia, but it isn’t quite there yet (I am not going to delve into issues of animal welfare here, but that excluded). Or perhaps, we need a new national event, that includes all Australians and provides us occasion to celebrate our lives even more powerfully and colourfully. The issues involved in considering The Melbourne Cup are manifold. But we have the power to change the culture. Heck, we are the culture. Do you think we need a change? Download Daybreak for iOS or Android to change your drinking habits today. Alternatively, join our online community of over 100,000 like-minded individuals.